At 7pm last night, the curtains closed as the 2010 Furnish exhibition in Bristol came to an end. It’s hard to gauge at this point just how “successful” this has been for everyone involved (speaking in the sense of running a business, receiving fresh inquiries and taking commissions…). Everyone seems to have enjoyed it although, some days were quieter than others. 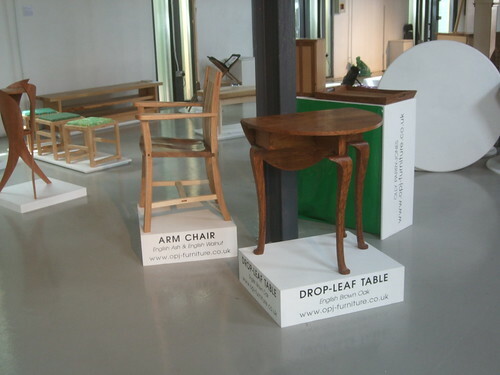 For several (myself included), this was the first furniture exhibition we’d been involved with and there’s certainly much that we can take on board from this. All round, the quality of the work on show was excellent and it seemed to be very well received by the public, judging by the words left in the comments book. There’s talk we could get together and repeat this event (with new pieces, of course!) again, next year – I’d certainly look forward to that! Rather than posting them all here, it would be easier for me to direct you to my Flickr album, where I’ve uploaded my own low-quality shots of some of the pieces (unfortunately, I had to delete a few because they were even more blurry than some of the ones you’ll see there! :oops:). Bear with me and I’ll have a brief description for each photo, detailing who the maker is. Simon’s also organised another Flickr account for everyone to upload their own photos of the event in to the same place – it’s fair to say that those with better cameras and a little know-how have done a better job at capturing our work than I have! Have a little patience and hopefully this album will be full with a week. Click here to see it. Now, I’m looking forward to ‘Inspired‘ (at the Ashton Court Estate, Bristol). We set up on Friday morning, ready to open Saturday morning. It’ll be interesting to see how this one compares (I know Sue has done this sort of thing before) and how it differs to the ‘Furnish‘ exhibition. I’m sure they’ll be something we can all take in and, with the show covering two weekends, I can’t think of any reason why the good (and wealthy! :-D) people of Bristol won’t be able to attend! My first exhibition (Furnish, at Paintworks) opens exactly one week from now and, right now, when I’m not doing any payed work, I’m spending all my free time trying to get my other pieces polished and ready (hence the lack of action on this blog, recently). 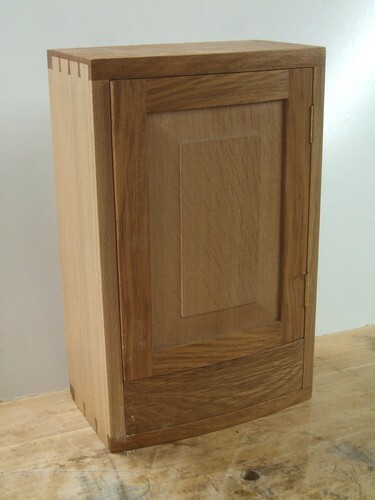 About two-months ago, I “completed” a contrasting curved-fronted cabinet in ‘white’ and brown oak. 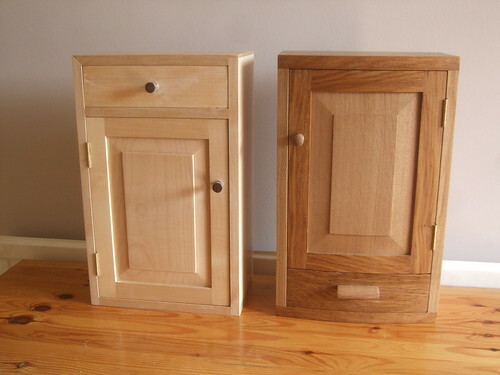 In actual fact, it’s still awaiting a final coat of wax and two knobs or pulls that’ll allow someone to actually open the door and drawer with ease… This is why the piece has remained unfinished, until now. Another day and another piece is ready for the Furnish exhibition in July! 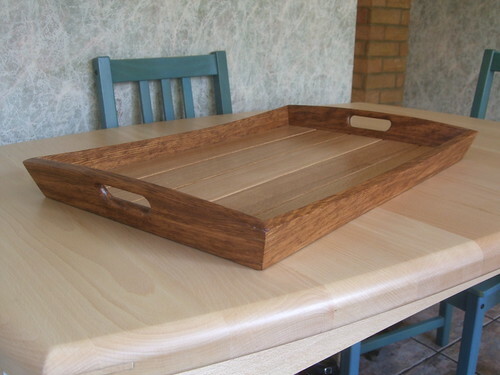 8) It’s a tea or ‘serving’ tray made from a contrasting combination of brown oak and regular English oak. 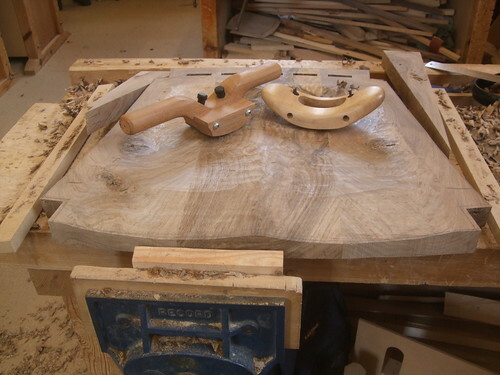 Sides are angled or ‘canted’ at 20° and, while it may look deceptively tricky to do; trust me – with a sharp blade and a half decent saw, a simple frame with compound mitres like this is a doddle to cut! 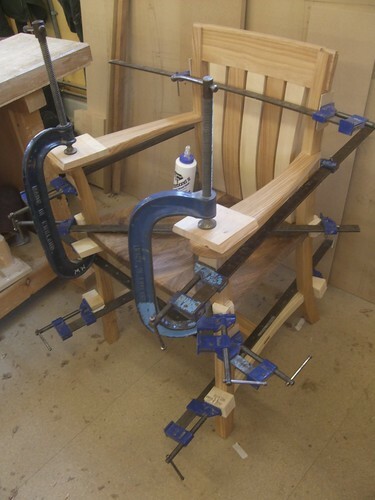 Gluing it up, however – not so easy!